Zion Market Research has published a new report titled “Organic Soy Protein Market By Type (Concentrates, Isolates, and Flour), By Product Form (Liquid and Dry), and By Application (Bakery & Confectionery, Infant Formula, Meat Alternatives, Dairy Alternatives, and Functional Foods): Global Industry Perspective, Comprehensive Analysis, and Forecast, 2017–2024”. 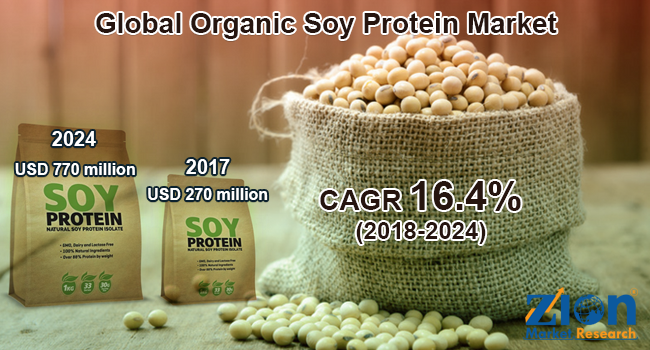 According to the report, the global organic soy protein market was valued at around USD 270 million in 2017 and is expected to reach approximately USD 770 million by 2024, growing at a CAGR of around 16.4% between 2018 and 2024. The protein extracted from soybean is known as organic soy protein. Soybean is a protein-rich legume with relatively low-fat content. For manufacturing soy protein, soybeans are then grounded into a meal, comprising no fats or hulls. The soybean meal is then converted into soy protein. Soy protein isolates contain approximately 90–95% proteins. The soy protein isolates are then sold in a powdered form that is rich in proteins and low in carbs. Moreover, additional nutrients can also be added to improve its nutritional value, texture, and taste. Soy protein offers all amino acids required for one’s healthy growth. Organic soy proteins are primarily used for their functional effects and nutritional properties under the normal dietary intake. Well-processed soy protein ingredients are good proteins for humans. Soybean proteins are used in human foods in varied forms, including infant formulas, flours, protein isolates, and concentrates, and textured fibers. The global organic soy protein market is likely to grow significantly in the future, due to the increased consumption of functional foods and healthy food products. Moreover, the rapid expansion of various end-use industries, such as bakery and confectionery, alternative dairy and meat products, and functional foods, is estimated to propel the expansion of the organic soy protein market in the upcoming years. Huge consumption of soy protein owing to its health benefits associated, changing lifestyles, and rising middle-class population are the key factors predicted to further drive the demand for organic soy protein products in the forecast timeframe. By product type, the organic soy protein market includes concentrates, isolates, and flour. Increasing demand for food processing activities and rising demand for soy flour in cookies, bread, pasta, cakes, soups, and related products are expected to drive the flour segment of this market in the near future. The availability of varied brands in the market is estimated to fuel the isolates segment. Evolving production methods and the rising number of manufacturers are estimated to boost the concentrates segment. By product form, this market is bifurcated into liquid and dry forms. By application, the market is segmented into functional foods, bakery and confectionery, meat alternatives, infant formula, and dairy alternatives. Bakery and confectionery sector accounted for a major market share in 2017. The replacement of cow milk proteins with soy protein isolates formula is estimated to drive the demand for soy protein for the development of infant formula in the upcoming years. Improved lifestyles coupled with evolving dietary patterns are projected to enhance the growth of the dairy and meat alternatives. In North America, the organic soy protein market is surging at a considerable CAGR and held a major market share in 2017, in terms of revenue. This market’s growth is likely due to increased consumption of functional foods in Canada and the U.S. The European organic soy protein market is estimated to expand significantly over the forecast time period, mainly due to the changing approach of European functional food manufacturers toward organic soy protein ingredients. The organic soy protein market in the Asia Pacific is estimated to record rapid growth over the forecast time period, due to the increasing middle-class population base. Additionally, the increasing consumer trend toward nutritious diet consumption is anticipated to further enhance the market growth in the upcoming years. Growing health-conscious population in Latin America is anticipated to spur the organic soy protein market in the future. The Middle Eastern and African organic soy protein market is estimated to grow in the years to come, owing to rising consumer preference for a healthy diet. Some key players included in this global organic soy protein market report are Omega Protein Corporation, Cargill Health & Food Technologies, SunOpta, Inc., Burcon NutraScience, Armor Proteins, DuPont, Bunge Alimentos S.A., The Scoular Company, George Weston Foods, ADM, MGP Ingredients, Harvest Innovations, Kellogg Company, Kerry Ingredients Inc., Devansoy Inc., Natural Products, Inc., Kraft Foods, Hodgson Mill, World Food Processing, Agrawal Oil & BioChem, Frank Food Products, Dean Foods Company, Gelita Group, Doves Farm Foods, Manildra Group, Biopress S.A.S., and DuPont Agriculture & Nutrition.